After several months of not having Coffee Mate in the house due to A. E.'s addiction, I felt sorry for the Hubster and purchased a box. It didn't take long for the A. E. to "ferret" it out. I caught him in the act as he was investigating the pantry on his way to the "crack". Thanks for stopping by my little piece of the web. I look forward to reading what you have to say! Can we Talk about Packaging? Today, many people (myself included) use ancient chain maille armor techniques to create jewelry. Basically, artisans take small rings made of wire and weave them together in intricate designs. In this way, the ancient weaves are re-imagined for a modern audience. Although some people take raw wire and create their own rings, many rely on retailers for their needs. From that need, a growing cottage industry has sprung up to supply makers with kits that include all of the rings and instructions for a design. Most of these businesses use very simple packaging for their products. Zipper seal bags with simple printed labels are very common. 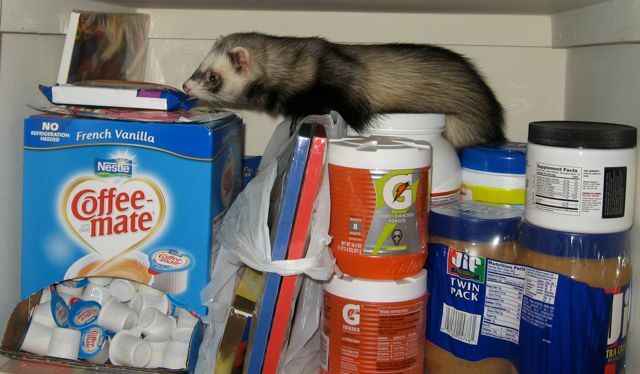 We have discovered that our ferret is an addict. There is one thing that he loves most in this world, and I am sure that you would never guess what it is. We don't even know how he first discovered it, but all it took was leaving the kitchen pantry door open one time. What is this crack for ferrets you ask? Coffee Mate French Vanilla creamer in those cute little individual cups (and if you dare to follow the link, the comments make me think our ferrets isn't the only one that is addicted).